Yep, bees! We did it! We took the plunge. I think we threw ourselves into it being semily ready, but yet not super ready. This all started with my husband sending me a craigslist post of some used equipment and saying hey this is a good deal. So of course, we set up a meeting and went and checked out the equipment. 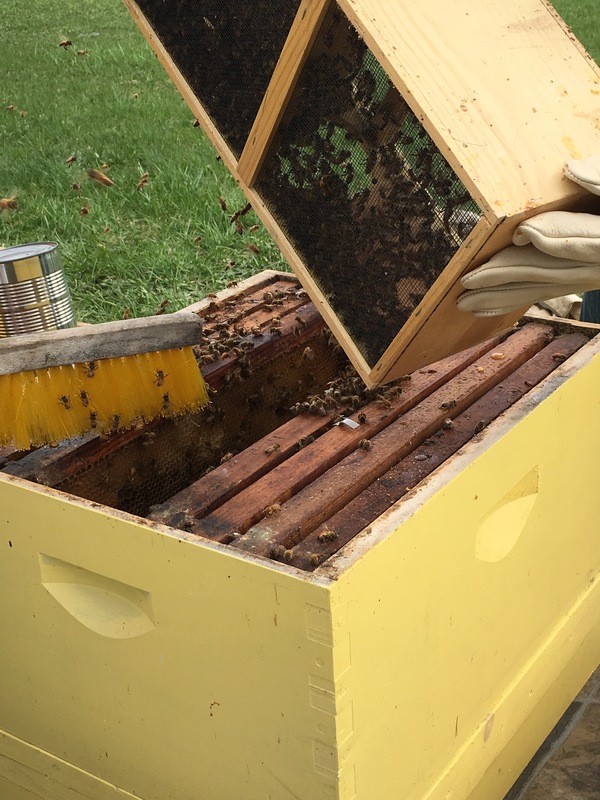 The equipment was in decent shape, and the guy was just “getting out of the bee business” because he didn’t have time any more. 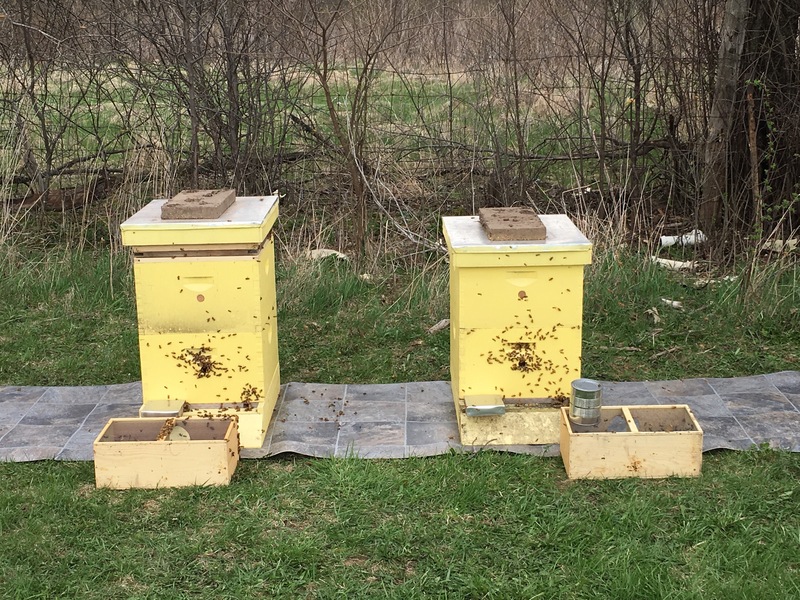 This is always a good way to get cheap equipment IF you know that the hives were not infested with anything (varroa, colony collapse for any reason, and any other infectious type problems). 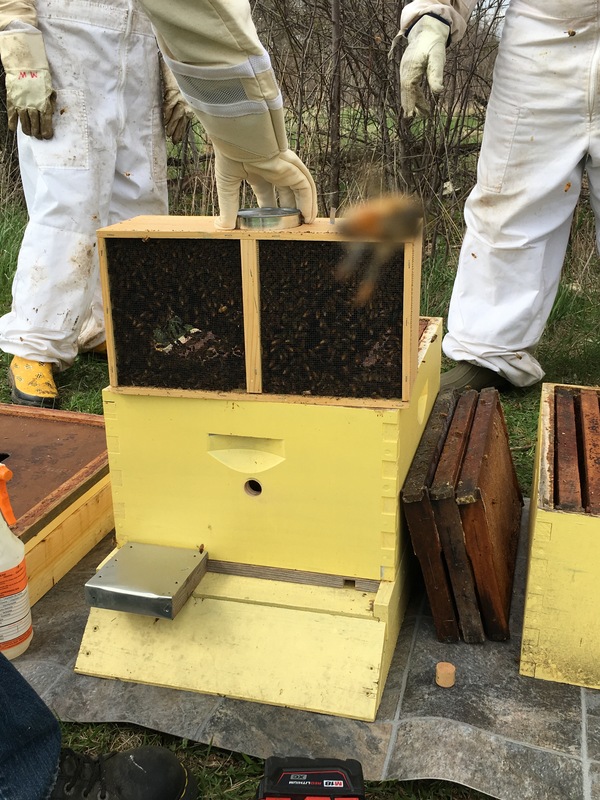 After finding our equipment we were quickly in the scramble to find bees, because apparently you order bees around December or January if you want a box of bees, verses nukes (which are a partially established colony) which are available a lot later in the spring. 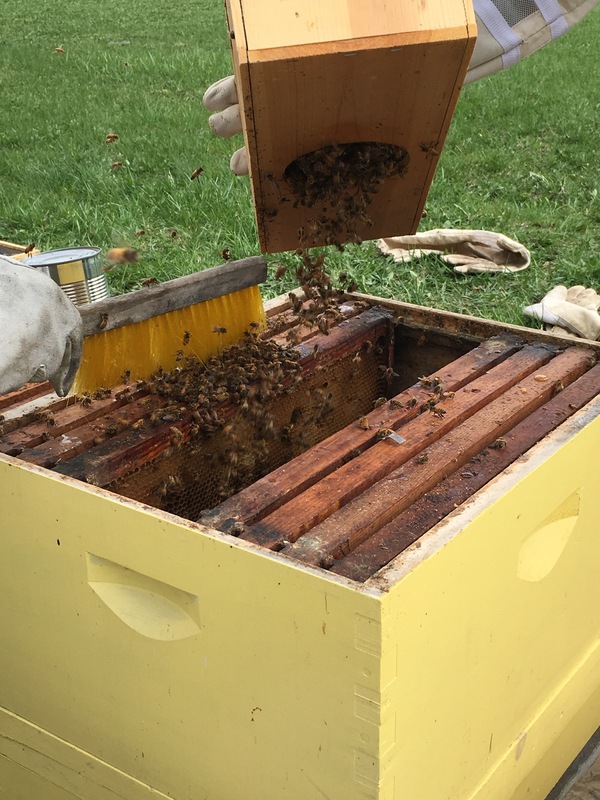 Luckily, my friend’s boss (our now bee mentor) is a beekeeper and had extra bees ordered since a lot of their colonies survived the winter. 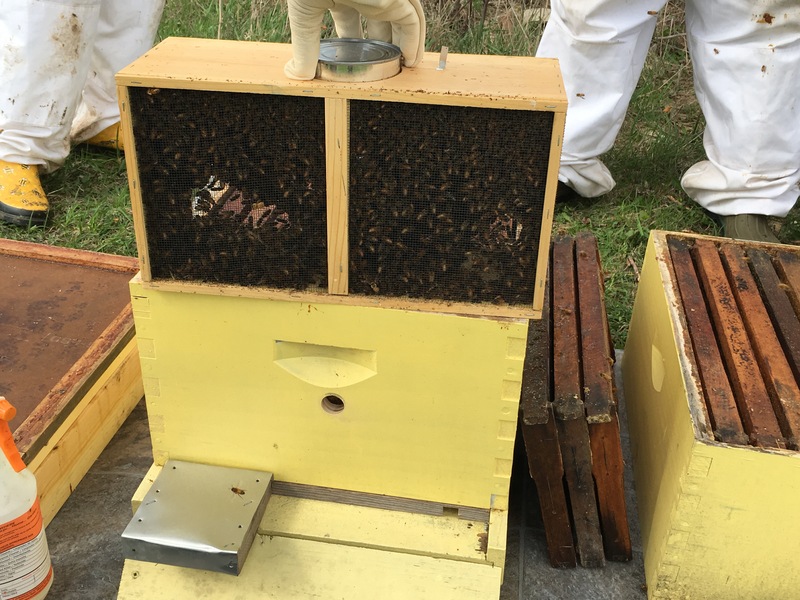 So now we had hives, and bees, and had to get some extra equipment. We found out what equipment we would need by meeting with the bee mentors and learned things from certain signs from the bees (ex. 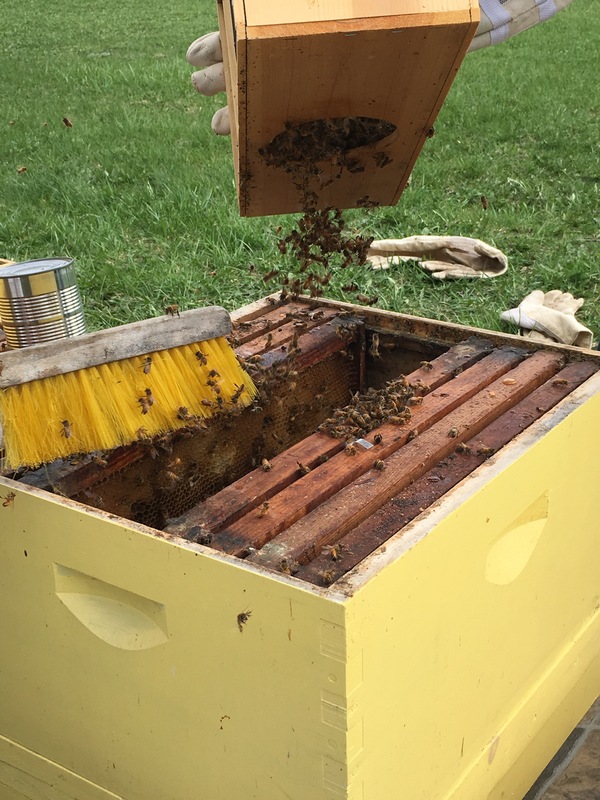 if they are bearding on the box-add a new box for the hive, they need more room), watch for pests by checking any dead bees that may be placed outside by the hive (who do clean up very nicely…much more than I clean my home 😉 ), how to feed them when there are no nectar sources when we first begin, etc. etc. I went and purchased our hive tool, veils and gloves, smoker, and our bee brush. 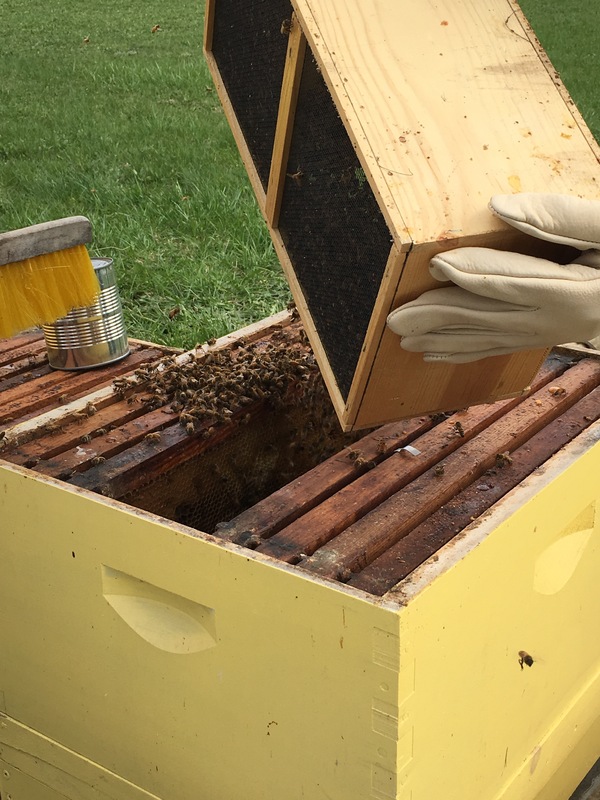 Tim got a blueprint for a feeder to build and made those, I made the sugar water (since we didn’t have any raw honey to feed back to them), and we waited for bee arrival day. And then let the shaking begin! Yep so that is all we had to do and walah we have two hives established! The bees fly into their hives if they miss the box, because they can smell their queen and head to be with her! We finally are starting to settle in at our new house. Unfortunately, we have a pretty big project we had to start with right off the bat. Our shower was very weak due to some old pipes, so Tim and his dad replaced the pipes for the shower. This project lead to Tim also redoing the plumbing, electric and drain for the washer and dryer, which makes all the plumbing and such in the wall, not in the pantry!) Since the pantry walls got torn up, we have been without a pantry since we moved in, in early November! We moved! It is official! We own 8 acres! And with the 8 acres came a barn! We had decided we would put the chickens in the barn and make it work! We had started building part of the corner of the barn into a chicken pen. This way they would have room and be okay from predators. Tim went right to work building the new pen. After the framing and predator proofing was done, we found some old hinges and made a quick plywood door. For locks we just took small pieces of wood and screwed them in loose, to hold the door shut and to get out of the way nice and easy! The next thing to do was attach the chicken wire to the framing. The chicken wire ran all the way from the framing to the rafters to help keep predators from climbing in! Once the wire was in all we had to do were finishing touches, roost poles and nesting boxes, place the bedding on the floor and get food and water available. The chickens definitely enjoy the space in their new area and I am enjoying my new space too! So what was the point of this post? To show off the new area for our girls? Maybe. To show off our new farm? Maybe a little. But really the point of this post was to say you can make a full structure in an afternoon and to remember just because you make something, doesn’t mean it has to be permanent! So get out there and learn as you go but just do it! Don’t let the paralysis of analysis set in! Getting Ready for Winter- Chicken style!